Ucella is an agricultural world with an ideal environment for producing food from plants, animals, or other forms. The system has a population between 100,000 and 10 million sophonts. 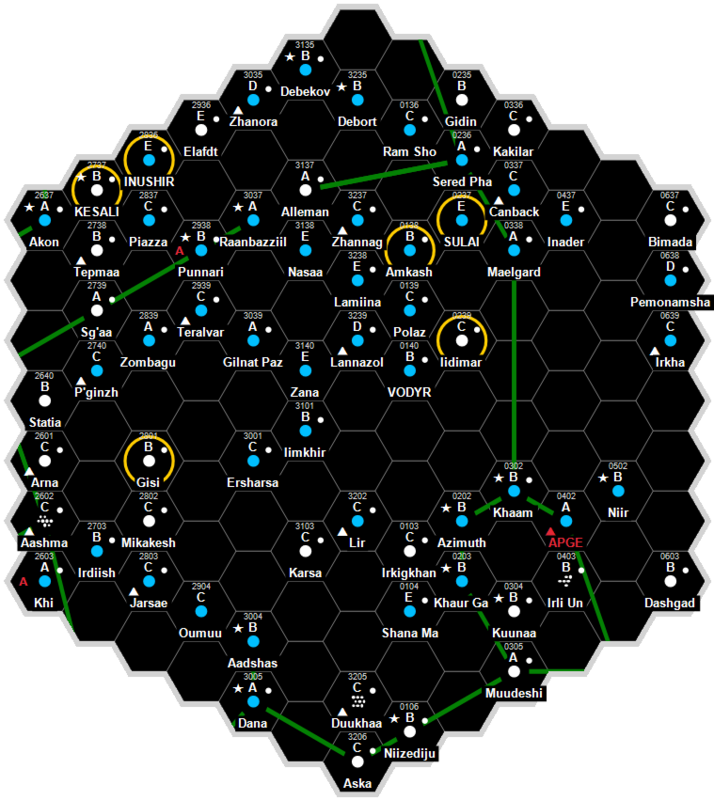 It is a client state of Third Imperium in the Five Sisters Subsector of Spinward Marches Sector. Ucella is an agricultural world with an ideal environment for producing food from plants, animals, or other forms. The system has a population between 100,000 and 10 million sophonts. It is a client state of Regency of Deneb in the Five Sisters Subsector of Spinward Marches Sector. Ucella was a lush and inviting world when it was first surveyed by Ingaz Ruffleran in the first century. Aside from high temperatures and limited water resources, the world boasted a long growing season and rich, fertile soil. The first colonists came here in the late 400s to work the land, mostly as herders, and then as grain farmers. Despite its richness, the loss of Imperial interest in the subsector in the wake of the first couple of Frontier Wars and the Psionic Supressions limited its economic progress. Left outside of Imperial borders, its agricultural products became rather unimportant economically to its neighbors, and the world went into a protracted economic decline in the mid 800s. Ling-Standard Products approached the planetary government in the early 900s, proposing to build a number of "enriching industrial projects" that would elevate the population from poverty, and put it in the Imperial mainstream once again. Pitching a deal that was too good to be true, Ucella's government essentially capitulated to the company's implicit demands, eliminating oversight for the proposed development, and giving LSP an indefinite lease. Having tied the world to a gurney, Ling Standard Products proceeded to construct several chemical plants. Their pollution immediately tainted the atmosphere, poisoned the local Chirper population, and slowly wrecked the world's ecosystem. Agricultural output fell, further impoverishing the population. And using a loophole in the world's immigration laws, and reneging on their promise to employ the world's population, the company imported tens of thousands of workers from their offworld facilities to run the plant. In addition, tens of thousands of additional support personnel came with them, creating a segregated company town isolated from native Ucellans. LSP ran the plants in a high-handed and reckless manner, resulting in numerous accidents, and indulging in shady and illegal behavior. Contraband was manufactured alongside propellants, solvents and compounds needed by the Imperial military. The company's private shuttleports became "Tortugas" for smugglers and racketeers. Managers and employees were encouraged by their dominance to flagrantly disregard local laws. Protests to the Duke of Iderati went unheeded, and the company imported a large mercenary contingent to protect the facilities. Matters came to a head after the Collapse, when the Regency government stripped LSP of its business licenses in 1132 as part of a crackdown on corporate chicanery. An MoJ investigation into its local operations led to the plants being seized, and criminal indictments against company managers for conspiracy, racketeering, smuggling and the manufacture of contraband. LSP withdrew completely from the world in lieu of regaining its licenses again, and a slow recovery is still under way. The local Chirper population has begun to recover, and are the focus of the new Droyne uplift program run under RISS supervision. The massive reduction in population is a reflection of the withdrawal of the sprawling LSP compound and its personnel, rather than any kind of major catastrophe. The environment has undergone enough of natural recycling that agricultural production is beginning to reapproach its old levels. While still poor, and still outside the Regency border, trade coming from the Hinters has created a viable source of secondary income, and the world has had an amicable relationship with the Regency as a client state. RQS teams even volunteer to help the locals in their clean up efforts. Most of the plants were unsalvageable for recycling or conversion, and it took a concerted fifteen year cleanup by MoI, paid in large part by fines extracted from LSP, to just make the countryside around them livable for the locals. Many plant and dump sites are beyond reclamation. Most have simply been stripped of their contaminated soil and water, and the waste shipped offworld for incineration. Many others still await cleanup, and the Amber Zone reflects the dangerous nature of these sites. Dave Nilsen. The Regency Sourcebook (Game Designers Workshop, 1995), 48. Martin Dougherty, Neil Frier. Behind the Claw (Steve Jackson Games, 1998), 53. This page was last modified on 4 July 2016, at 11:11.